The fashion industry is intimidating. And if you don’t know the right fashion terminology and abbreviations, you can embarrass yourself…like I did. Years ago when I first got started in the industry, I had no idea what a tech pack, BOM, graded spec or block was. CF, HPS, DNTS…it was acronym and terminology overload. At my first job in the industry, the CEO had no forgiveness for a beginner. And it terrified me. She’d ask me questions using unfamiliar words as I stood there like a deer in headlights. I’d fumble, desperately trying to give her the answer she wanted, but nothing coherent came out. Which is why I made this guide. So you can sound (and act) like a pro. I’ve tried to give you just what you need, but not too much. 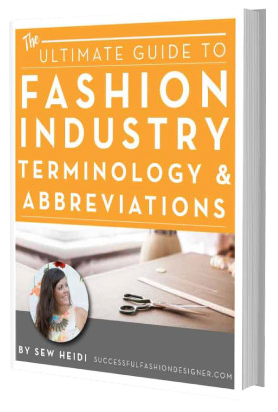 There are hundreds of terms and abbreviations unique to the fashion industry. So as to not overwhelm you, I did not include every single one. Instead, I included the ones I felt were the most common and important. 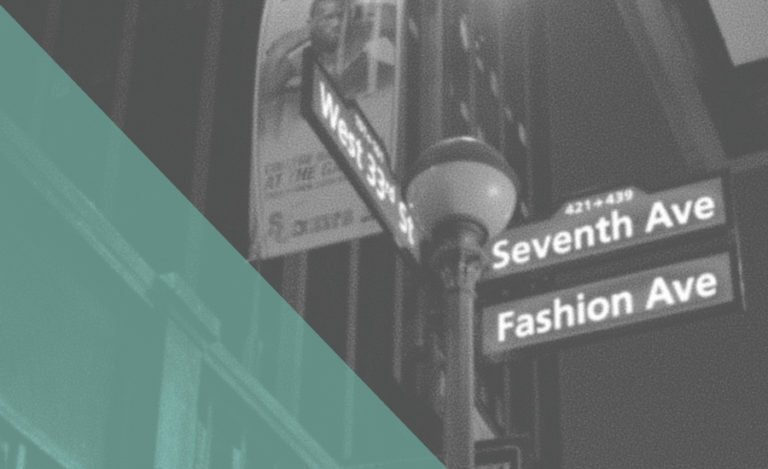 Depending on your work, some fashion terminology may not be relevant. So don’t feel like you have to know it all! It took me years to learn and remember all of this, and even to this day I still discover new words in the fashion industry. Thanks for being here and enjoy the guide! Being prepared with the appropriate assets and presenting them in industry standard formats will facilitate the production process. With the right planning, factories will understand your needs better and will take you more seriously. A 2 dimensional sketch usually done in black and white with accurate design details such as stitching, trims, etc. Flat sketches are sometimes filled with color or patterns to show colorways in your tech pack or for presentations. 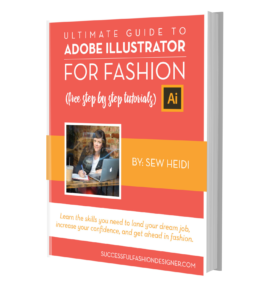 Learn how to sketch flats in Illustrator with my free course. A flat sketch with text callouts to specify various design details. Pro Tip: A tech sketch should not be an artistic representation of the design but rather a flat 2d drawing to show accurate details. The exact color that you’ve picked for your design that’s used as a benchmark (standard) for all production. Example: Industry recognized books such as Pantone or Scotdic are often used to choose color standards. Pro Tip: The rainbow of color in industry books can be limited. So while not ideal, some designers will use a piece of material (fabric, yarn, or even paint chips) as a color standard match a unique shade or hue. A product in a specific color. Example: If you offer the same jacket in Olive and Deep Sea, you have 2 colorways. Example: A tech pack can be used by your factory to create a perfect sample (without them asking any questions). This probably won’t happen and questions are inevitable, but keep the goal in mind: provide thorough instructions that are easy to follow. Pro Tip: Your tech pack is also used to track approvals, comments and changes made to the product throughout the development cycle. It acts as a master document that both the factory and the design / development team will reference. Part of your tech pack, the BOM is a master list of every physical item required to create your finished product. Pro Tip: You know the instruction sets you get from Ikea with a list of every item included in the product? That’s kind of like a BOM! The type (ie unit) of measurement used for various items or parts of your product. Trim UOMs (ie buttons) is each or piece. Fabric UOM is yard or meter. Product UOMs (ie pocket height) is inches or centimeters. Specific points on your product that are defined and used for measurement. Most often they’re measured on a flat product (not on the body). Pro Tip: POMs are not universal and must be specifically defined. You can create your own definitions and sketches or use The Spec Manual book. Included in your tech pack, it’s a chart of POMs (points of measure) for your product in all sizes. The difference in measurements as sizes go up or down. Example: If body length of a size M shirt is 27” and a size L is 28”, the body length grades 1” between sizes. Pro Tip: Grading is not a perfect science and for production line manufacturing should be done by a professional. As certain measurements grade up or down, the grading severity may decrease. Using the body length example above, size XXS would drop all the way to 24” which may be too short. Just because a person gets a lot smaller (or bigger), doesn’t mean they become shorter (or taller). A basic pattern that is used as a foundation to develop other styles. Example: You would have different blocks for tops, dresses and bottoms, but there may be crossover for some measurements to ensure consistent fit across styles. Want some examples? Ralph Pink has a collection of free blocks. Pro Tip: If you’re a home sewer, you may call this a sloper. As you head into product development, there are many abbreviations used to reference parts of the garment or types of construction. Factories and design teams will use these abbreviations casually and quickly in writing and in speech. Knowing these abbreviations means you can talk the talk…like a pro. The center of your garment running vertically along the front. The center of your garment running vertically along the back. The opening in a garment where the arm fits through. The highest point of the shoulder on your garment, not including any part of the collar. The seam that runs along the side of your garment. Some garments like leggings or circular knit sweaters may not have an SS. Where the inseam and the front / back rise meet. The total measurement from one point to another. The number of stitches per inch / centimeter. The area between the edge of the fabric and the stitch line. The amount can vary from 1/4 inch to several inches. A stitch done with a single needle. A finishing stitch that is done on top of the product with a single needle. A finishing stitch that is done on top of the product with a double needle to create two parallel stitches. The most common stitch done with a single needle on a machine using a top thread and a bottom thread that are “locked” together. A double or triple needle stitch on one side and “zig zag” loops on the other. The loop side is often inside the garment and is used to “cover” raw edges, but in activewear it may be on the outside as a design detail. Stitching on the top side of a product as a decorative feature. Stitching parallel to a seam edge on the top side of a product. Often done to secure a serged seam flat or a set on detail (ie pocket) and create a more finished look. A series of stitches that loop together like a chain. The number of knit stitches per finished inch. Example: A smaller gauge (1GG) will be a chunkier knit and a larger gauge (16GG) will be a finer knit. Learn how to measure gauge. A manufacturer who can cut your fabric, make your product and apply trims (buttons, labels, hang tags, etc). You provide all the raw materials, they do the physical assembly. Pro Tip: You can save costs and gain control using a CMT vs a FPP (defined below)…but it can also be a lot more work for you since you have to source and coordinate delivery of all physical materials to your CMT. A manufacturer who offers every service you may need from design to pattern drafting and sample making to production. Pro Tip: The FPP is a one stop shop…but they may not require you do everything with them. If you have designs and tech packs, they can manage sourcing and production. You may be able to pick and choose just the services you need. Goods that are in the process of being made at the factory but not finished. These goods are not counted as part of inventory yet. The country that a product is produced in. Example: If fabric is imported from Taiwan and trims come from China, but product is cut and sewn in the US, your COO is USA. A small fabric swatch (~2×3 inches) that your factory dyes and submits for color approval to make sure it matches your color standard. Lab dips are typically sent with 2-4 options so you can choose the best match. Pro Tip: Lab dips should be reviewed in a light box with controlled settings (D65 Daylight is most common) and it’s essential to compare them to other approved submits in addition to the original color standard. Subtle shade or hue variations can be compounded and this will ensure your fuchsia leggings match your fuchsia jacket even if they’re different fabric qualities. A larger swatch of fabric (~8×8 inches) that is cut from the bulk bolt for your approval. It should match the approved lab dip in color and be the correct quality, weight and construction. Pro Tip: This is your bulk fabric approval and should be kept to compare to production or used as a reference for future orders. Woven fabric that the factory submits for construction, design and layout approval before bulk fabric is made. Handlooms are manually on a machine called a handloom (yes, both the fabric swatch and the machine are called handlooms…). Learn more about looms at Offset Warehouse. Pro Tip: Handlooms may be submitted in available color yarns so always ask what you’re approving – color, repeat, layout, construction, etc. Printed artwork that the factory submits for approval. It can be for any type of printing (screen, sublimation, etc) and any type of artwork (repeating pattern, placed/engineered prints, etc). Pro Tip: Strike offs may be submitted on available fabric and ink colors so always ask what you’re approving – color, repeat, layout, hand feel, etc. Knit fabric that the factory submits for knit structure, design and layout approval. Pro Tip: Knit downs may be submitted in available yarn colors so always ask what you’re approving – color, repeat, layout, construction, etc. Fabric that has been knit or woven but not yet bleached, dyed or finished. Pro Tip: You can keep greige for frequently used fabrics in stock at the factory. This can speed up production time by 30-60 days. But beware! Greige has a short shelf life (~3 months) before it starts to deteriorate, so you’ll need to make sure you can use it quickly. A sample to make sure various (or all parts) of the product are executed correctly. Protos are often made with closest available trims and fabrics and are used to check fit, construction and detailing. Pro Tip: Depending on the complexity of your design, factory expertise, and how long you have (or haven’t) worked with them, you may need multiple protos to execute your vision. One or two is standard and three is acceptable. Any more and you may not have a good factory match. The last sample sent for approval before production begins. It should be 100% correct for fit, design, color, trims, etc. 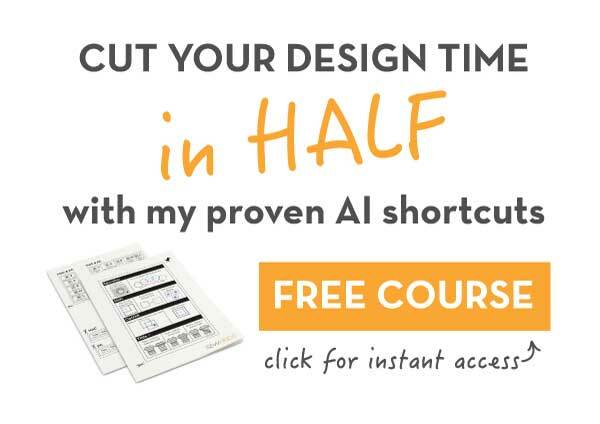 It’s your last chance to make changes or catch mistakes…and even then they may unfixable. Example: If a hangtag or label is in the wrong place, this can be fixed for production. But some things like fabric color or quality can’t be fixed since it’s already developed. Pro Tip: If you do notice something “unfixable” in the PP sample, compare it to approvals (ie the head end for fabric color or quality). If it matches the approval, there’s no recourse. If it doesn’t match the approval, let your factory know right away. Depending on how bad the mistake is, you can negotiate a discount or require it be redone (which can cause production delays). A sample pulled from the top of the production line. It’s used as a reference for what bulk production should look like. Pro Tip: If you notice a mistake in the TOP sample…it’s too late, production is done. But, you may have recourse. Compare it to the PP approval and if it doesn’t match, let your factory know right away. A set of samples in the full range of sizes offered. Size runs should be measured flat and tried on fit models to make sure they fit well in all sizes. Pro Tip: Depending on design complexity, how many similar styles you have, and how long you’ve worked with the factory, a full size run (every size, ie XS, S, M, L, XL) may be required. Other times, a jump size run (every other size ie XS, M, XL) is enough. A person who maintains their physical size and tries on product to make sure it fits well. They are typically not “standard” runway model size, but rather the size of your customer. Pro Tip: Some fit models will not only try on the product, but will wear or use them in real life settings and provide feedback. This is common in activewear, performance products or other goods that must withstand certain uses. The middle size in your size range. It is the default size that will be used for protos and other samples. Example: If your size range is 2, 4, 6, 8, 10, 12, your fit size may be 6 or 8. Pro Tip: Typically the fit model will be the same size as your fit size. The size your SMS (salesman samples) come in. Pro Tip: It may be the same as your fit size, but not always. Some designers choose a smaller size as it can look more appealing on a hanger, whereas some designers choose an average size so buyers can try it on. A sample product in correct fabrics, trims, colors and fit used by a salesperson to sell and book orders or pre-orders (before production is made). Pro Tip: Occasionally there are mistakes or changes in SMS that will be made in bulk production. While not ideal, buyers know this happens and with a simple explanation can often overlook it. Most of these terms are specific to overseas manufacturing. If you’re working domestically, they’re less relevant but still good to be familiar with. A tax or tariff on goods that are transported across international borders. Tax rates are determined by HTS Code and vary tremendously based on product content, performance features, etc. Example: Duty on a cotton shirt cotton will be different than the same shirt made in polyester. Duty on a jacket made with waterproof fabric will be different than the same jacket made from non-waterproof fabric. Pro Tip: If you’re manufacturing overseas and don’t want to manage duty, request DDP / LDP pricing. You’ll still be paying it, but the cost will be bundled. Codes that are used to classify internationally traded goods. HTS codes determine the duty rate. Pro Tip: It can be overwhelming to know what HTS code to use, and using an incorrect code (whether intentionally to get a lower duty rate or unintentionally out of ignorance) can cause delays or penalties in customs. Make sure you use the correct code by working with a freight forwarder or consulting with your factory. A third party service that manages shipping and importing. This includes freight logistics, insurance and duty (with correct HTS categorization). Pro Tip: Many businesses work with a FF to manage imports because it’s not as simple as shipping goods from point A to B. Pricing that includes material, labor and transportation to the COO exit port, but excludes shipping, duty, insurance or taxes. All costs and liabilities after exit port arrival are your responsibility. Example: An FOB price will get you a finished product delivered to a port in China. (Fun) Pro Tip: The saying “a slow boat from China” originates from the fact that a product may spend between 30-45 days getting from China (or the COO) to you. Pro Tip: Boats are slow but inexpensive for transport. Air freight will get your product delivered faster but will cost substantially more. Pricing that includes all costs to produce and deliver the product to you. The factory (seller) is responsible for all costs and liabilities until the product is in your possession. Pro Tip: Some factories don’t offer LDP/DDP pricing as it’s more work (even though they usually add markup). For many buyers however, it’s a great option as you don’t need infrastructure to manage shipping and importing. Pricing of the product available for pick up by you (the buyer) at the factory. FGP / EXW excludes any transportation costs. Manufacturing overseas can be overwhelming. Not sure if you’re ready to fuss with FOB, HTS codes and FF’s? Richard at A Better Lemonade Stand covers the pros and cons, his personal experience, and shares a free guide to 50 US Manufacturers. Congratulations, you now know the essentials! You have a great foundation of terminology and abbreviations to sound like a pro. But there is always room to grow. If you hear a new word, be honest and humble. Most people are happy to share knowledge with those willing to learn. Remember, it’s ok not to know everything!